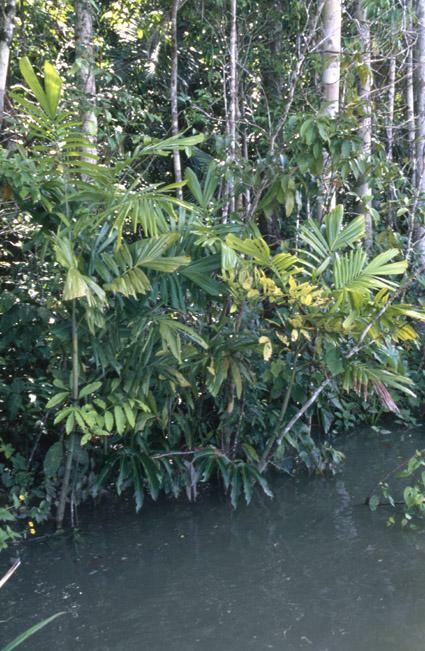 This genus is accepted, and its native range is Papuasia. 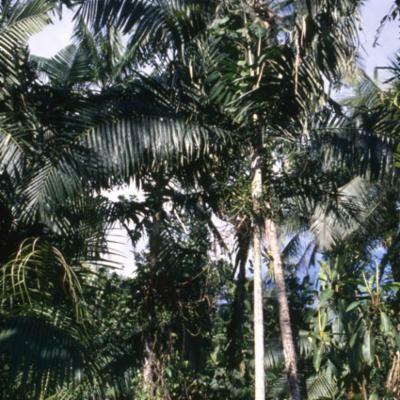 Moderate, solitary, unarmed, pleonanthic, monoecious palms. 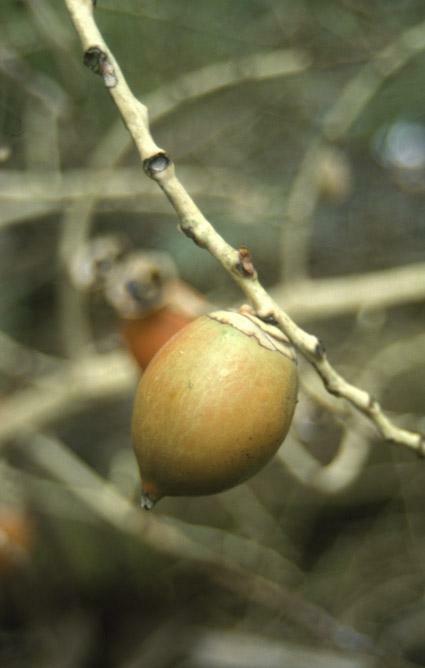 Stem slender to moderate, ringed with leaf scars, grey or brownish. Leaves pinnate, spreading to ascending, blade ± horizontal basally but twisting toward an arched apex; sheath forming a long crownshaft, margins oblique lacking a ligule, covered in dense, partially deciduous scales or tomentum; petiole very short, channelled adaxially, rounded abaxially, densely tomentose; rachis adaxially flat basally, with a central ridge at midlength to ridged distally, abaxially rounded, densely tomentose; leaflets lanceolate, single-fold, apically very oblique, truncate, or somewhat pointed, and toothed, red-brown or pale scales on both surfaces, denser abaxially and along veins, midrib prominent, marginal ribs also large and sometimes (?always) densely tomentose, transverse veinlets not evident. 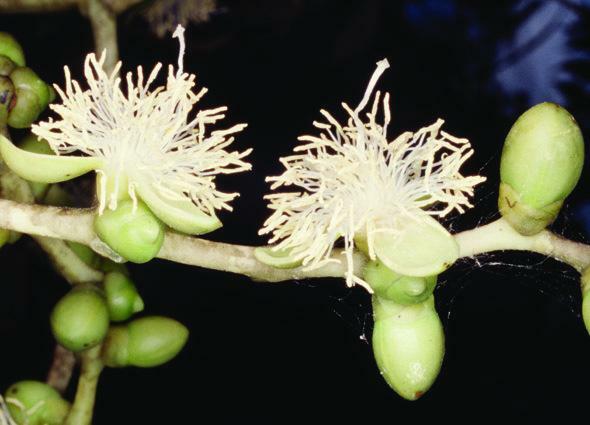 Inflorescences solitary, infrafoliar, stiff, usually several clustered below the crownshaft, horizontal in flower, drooping in fruit, branched to 3 orders basally, fewer orders distally, all branches densely scaly, becoming glabrous; peduncle short, stout, dorsiventrally compressed; prophyll tubular, 2-keeled laterally, slightly beaked, bearing deciduous tomentum; peduncular bract like the prophyll but lacking keels, second partial peduncular bract present in young stages; rachis longer than the peduncle bearing very short, wide, rounded bracts subtending distant branches and rachillae; rachillae rather short, sometimes zigzag, bearing very short rounded bracts subtending distant triads of large flowers, flowers borne nearly throughout the rachillae, projecting on either side of the rachillae; floral bracteoles irregular, rounded, those surrounding the pistillate flower of medium height; scar of pistillate flower very large compared to those of staminate flowers. Staminate flowers slightly asymmetrical; sepals 3, distinct, imbricate, keeled dorsally toward a gibbous base, margins split and bearing hairs; petals 3, distinct, valvate, ovate, glabrous or densely covered in small membranous scales; stamens numerous (up to 100), filaments short, awl-shaped, anthers elongate, notched apically, deeply bifid basally, dorsifixed near the base, ± introrse, connective tanniniferous; pistillode bottle-shaped with neck as long as the stamens, apically with a few short pointed tips. Pollen ellipsoidal asymmetric; aperture a distal sulcus; ectexine tectate, perforate, aperture margin similar; infratectum columellate; longest axis 46–66 µm [2/3]. Pistillate flowers ovoid, smaller than the staminate at anthesis; sepals 3, distinct, imbricate, rounded, sometimes covered with small hairs; petals 3, distinct, broadly imbricate with short, thick valvate tips, sometimes densely scaly; staminodes 3, ± united in a low semicupule; gynoecium ovoid, unilocular, uniovulate, style not differentiated, stigma 3-lobed, ovule pendulous, 5-angled, form unknown. 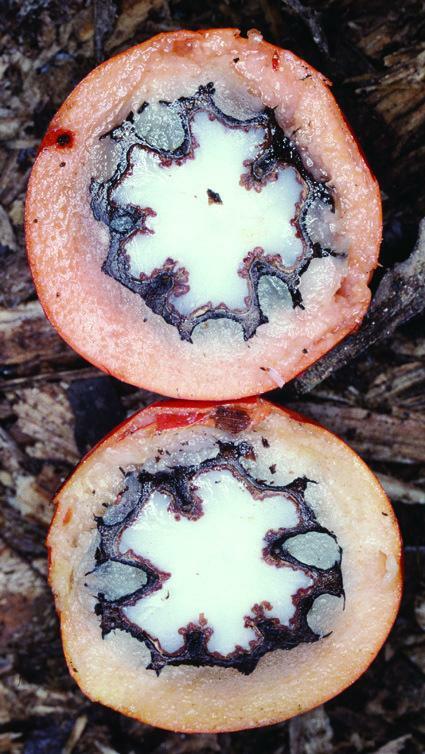 Fruit ovoid, prominently wrinkled and angled when dry, orange to red at maturity, perianth persistent as a large cupule, stigmatic scar slightly eccentric; epicarp with short oblique fibrous bundles and interspersed brachysclereids, mesocarp fleshy with tanniniferous cells and vascular bundles lacking fibrous sheaths, endocarp with large keel, deeply grooved between 3 lateral and 2 ventral ridges, wall hard, thick. 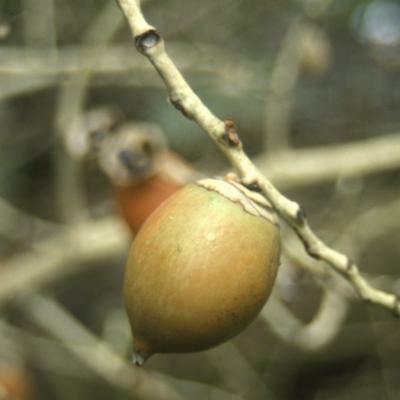 Seed 5-lobed, like the endocarp in shape, hilum round, apical, raphe branches thin, endosperm homogeneous with shallow marginal ruminations and a deep intrusion in the rapheal lobes or deeply ruminate; embryo basal. 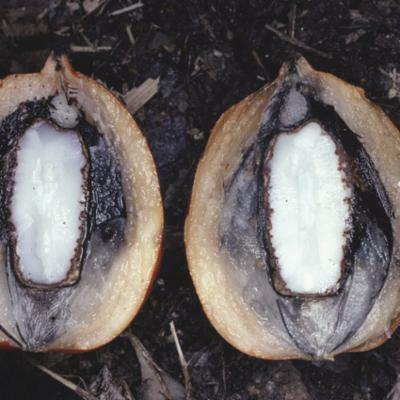 Germination adjacent-ligular; eophyll bifid, tips toothed. Cytology: 2n = 32. 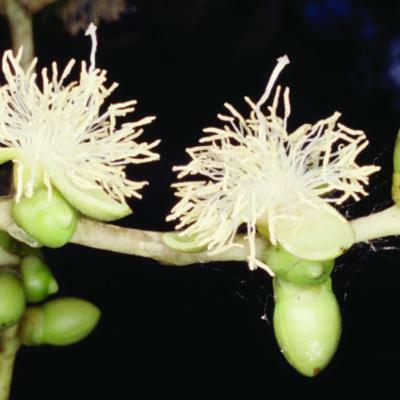 Two species, in New Guinea Bismarck Archipelago and Bougainville. 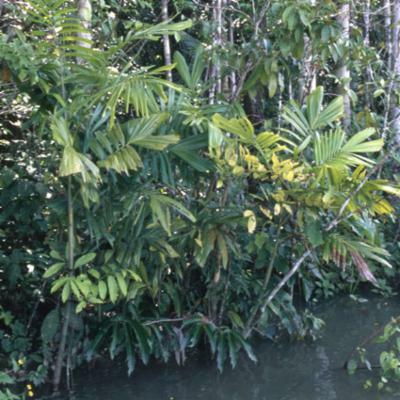 In rain forest along rivers in the lowlands and on mountain ridges. 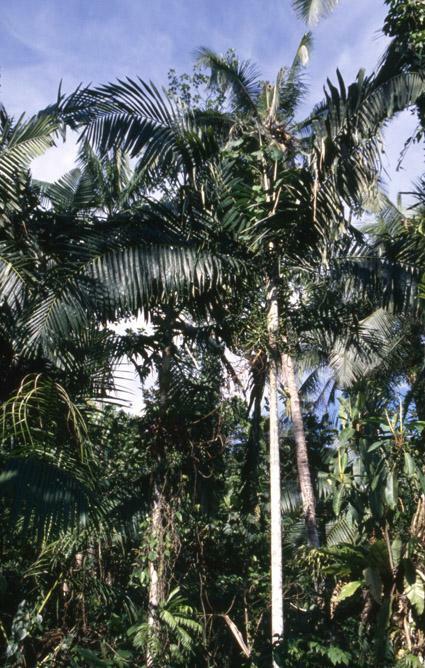 Moderate solitary pinnate-leaved palm, native to New Guinea, with crownshaft and praemorse leaflets; the fruit is relatively large and has an elaborated grooved and ridged black endocarp; the seed has homogeneous or ruminate endosperm. 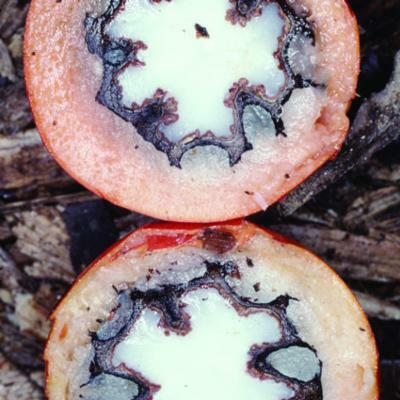 Leaf (Tomlinson 1961) and fruit (Essig 1977). The wood is extremely tough and used for bows, arrows, and building. 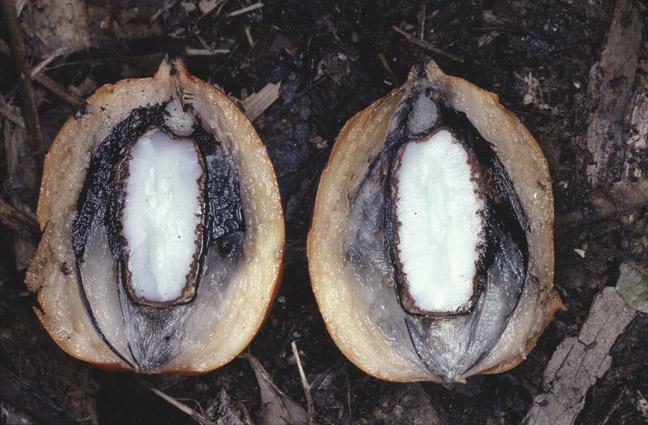 The seed is said to be edible.